We all know that America is no longer the fattest nation in the world. Mexico has pried that award from our chubby little fingers. But do we have the fattest girls in the world? A study has found more than half of girls in the US and the UK are ‘overfat’, putting them at risk of diabetes and cancer. In the rankings of the world’s 30 most developed countries, US schoolgirls are the fattest, followed by the UK on this measurement. It’s no secret that the world has been consistently getting more and more fat over the years. In nearly every country obesity rates are on the rise: in poor countries and rich countries, in young people and old. All the family-run businesses are being closed so the government can open up huge chain brands, Mcdonalds, KFC, Dunkin Doughnuts, Krispy Kremes, Starbucks, Costa…. The majority of the stuff they put in those foods/drinks SHOULDN’T be consumed. BUT it’s ok for the FDA to approve it at least under Obama there was no problem to do it! I have to admit I see some signs of improvements under Trump’s FDA but still, there is a lot of work to be done. The term overfat refers to the presence of excess body fat that can wreak havoc on health – even in normal-weight non-obese people. Excess body fat, especially around the middle, is associated with increased risk of chronic diseases, increased morbidity and mortality, and reduced quality of life. There’s no money in dead people, there’s no money in healthy people… You know where the money is? In the sick people! If you ask me all women are awesome! And don’t forget, just because we’re big as an Americans don’t mean we’re unhealthy. Skinny people can be unhealthy too. The real problem is the food that is approved by the FDA! The problem is also particularly pervasive in the UK and the US, where the Western diet is the universal preference. However, the researchers were surprised to discover that Iceland and even Greece – where people are generally thought to be healthier – had similar statistics. 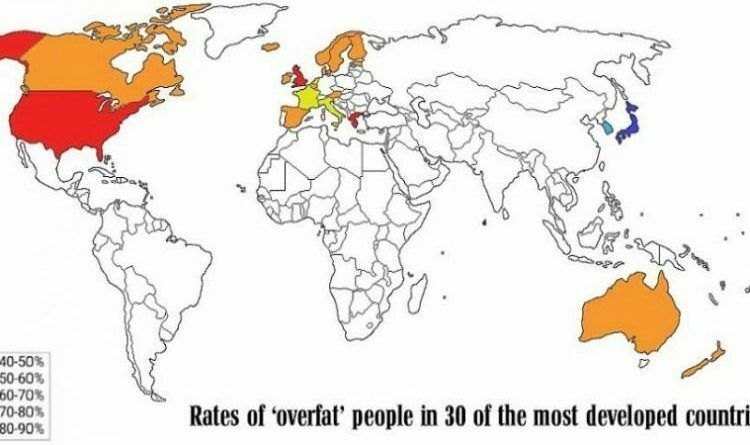 So the bottom line is that We the Greeks and the Brits have the fattest girls in the world! What do you think and are you surprised?